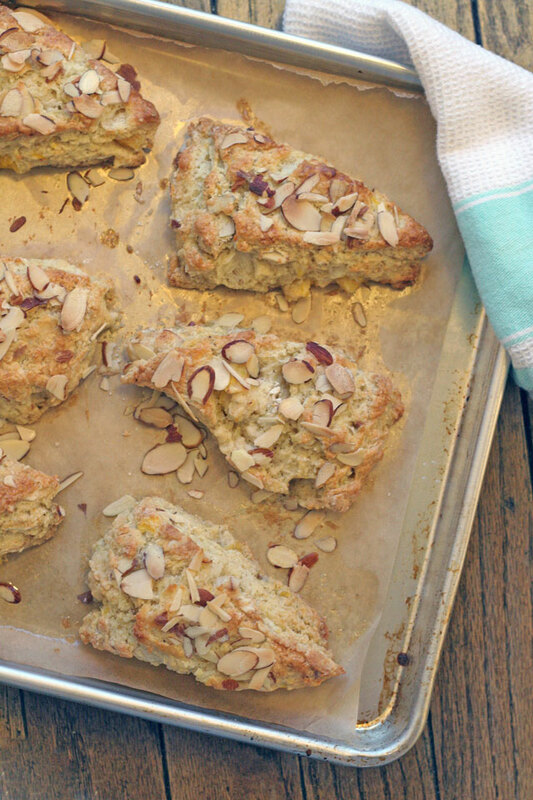 These Clementine Buttermilk Almond Scones Are the most perfect scones I’ve ever had. Perfect for any weekend breakfast or brunch! Scones are the perfect morning treat for family, friends, and out of town guests. It feel special to have coffee or tea a scone for breakfast, especially for the holidays. So I doubled the batch of this perfect clementine scone recipe I adapted from the Tartine buttermilk scone recipe to share while we have guests for a little something special. I now have my scone fix for a bit. Although the original Tartine buttermilk scone recipe has currants, which I do love, I was craving something citrusy for my scone fix this time around. Plus I have an obsession with Tartine, the bakery in San Francisco, so I had to make these asap. I had an idea to incorporate as many clementines as possible to really get the flavor to come through after baking, and it worked! Total success. I will add that I make and test recipes often, sharing with my family of course. I got, these are the best scones I have ever made. My family can be harsh and honest, so when I hear this, I’ll take it. It’s funny because they always like what I make, some more than others, but this apparently was the best. Place oven rack in center of oven and preheat to 400°. Line baking sheet with parchment paper. Add flour, sugar, baking powder, salt, and baking soda together in a large bowl, whisk to combine. Place the ice cold butter into flour mixture, using your hands rub the butter into the flour creating pea sized chunks. Add the clementines and nuts to mixture, combine gently using a spatula. Pour buttermilk into mixture, gently bring together in the bowl using a spatula. Once combined, take 1/2 of mixture and place mixture on lightly floured counter. Make a circle about 1 1/2 inches thick. Repeat with other 1/2 of dough. Then cut into each circle into 8 even triangles using a knife or bench scraper. For best results place on a plate or small cutting board and put in freezer for a minimum of 1 hour up to 24 hours. 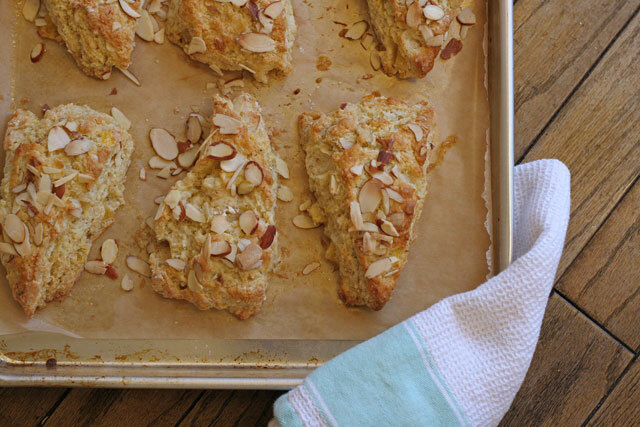 Once cold/frozen place scones on a parchment lined baking sheet, brush with egg wash and sprinkle with almonds. Bake for 20-25 minutes or until lightly golden brown. Store left overs in an airtight container on the counter for 1 to 2 days. Best if warmed for 30 seconds. This recipe is a mess – enough flour and butter for 2 1/2 dozen scones, but fruit and juice for one dozen. Don’t you check your work???? Not a contender for Tartine! Hi, thank you for stopping by and commenting. Have you made these scones from this recipe and had issues? You should try them if you have not made them yet. It is the actual recipe from the Tartine cookbook, no adjustments what so ever. Exact recipe. As a trained baker, I’ve seen and made hundreds of scone recipes. They flour butter liquid ratio is always high. This recipe is perfection, thanks to Tartine. Pure perfection. Thanks again! Go try them. These scones look fantastic! I love the idea of mixing up a classic scone with a tangy citrus punch. Hooray! Me too! I’m making shortbread cookies right after I reply to you, they are my favorite!